Imagine that you are in the process of unwinding at the end of a long day. Suddenly, your child who went to bed two hours ago lets out a blood curdling scream. You rush to your child’s room thinking the worst. When you open the door, you find your child thrashing around, eye’s wide open in a blank stare. Your child is acting as if he or she is fighting off an attacker but there are no signs of an intruder. You attempt to calm down your child but he or she is inconsolable. This seems to go on for an eternity as your stress level skyrockets. Fifteen minutes later, your child suddenly calms down and returns to a deep slumber. In the morning, you ask your child about what happened the evening before but he or she has no memory of it. What your child has experienced is known as a night terror. Night terrors, which are different than nightmares, are the result of an unusual behaviour of the nervous system leading to a sleep disruption that involves inconsolable fear. Seeing your child experiencing a night terror can be quite upsetting but night terrors are normally not a cause for concern. Sleep occurs in a set of stages designated based on particular brain activities that take place in each stage. During a stage called the rapid eye movement (REM) stage, dreaming, including nightmares, can take place. A night terror, on the other hand, is a sudden reaction to fear that occurs during the transition from one sleep phase to another. Night terrors usually occur after a child has been asleep for 2 to 3 hours when sleep transitions from non-REM to light REM sleep. A child can become agitated and frightened during this transition leading to fear reaction that is experienced as a night terror. During a night terror, a child might suddenly sit up, jump out of bed, shout out, or scream in distress. He or she may have an increased heart rate, rapid breathing or hyperventilating, or profuse sweating. He or she may be crying, lashing out, or acting upset or scared. He or she may get out of bed, run around the house, or engage in aggressive behaviours. He or she may stare wide-eyed and be unable to be woken up easily. Generally, a night terror lasts from a few minutes to 15 minutes at which time the child calms down and returns to sleep. Unlike dreams and nightmares, night terrors are not remembered by the child because the child is in deep sleep and there are no mental images to recall. Parasomnias, which include sleep walking and night terrors, are caused by an over-arousal of the central nervous system (CNS). The CNS regulates sleep and waking brain activity. It can become over-aroused as a result of the developing brain. Night terrors occur in up to 6% of children and usually occur between 2 ½ and 12 years of age. There is a smaller percentage of individuals that experience night terrors in adulthood. Night terrors are slightly more common in boys than girls. 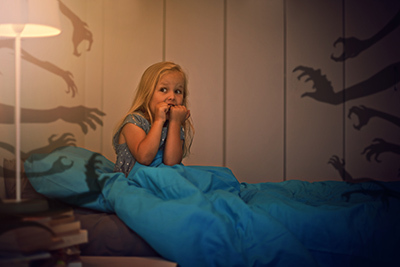 About 80% of children who have night terrors have a family member who also experienced night terrors or sleep walking. There is an increased risk for night terrors in children who are over-tired, ill, stressed, taking new medication, or sleeping in a new environment. Fevers, lights, noise, or an overfull bladder can also increase the risk. Night terrors are sometimes triggered by another condition that affects sleep such as disordered breathing (e.g., sleep apnea), restless leg syndrome, migraines, or head injuries. Night terrors can lead to excessive daytime sleepiness which can affect school performance, goal planning, or task completion. Children may experience embarrassment or fear over night terrors. There is also a risk that a child may injure them self or others. Parents often become frightened or stressed when their child experiences a night terror. The best response is to wait the night terror out while ensuring your child is not hurting them self or others. Attempting to wake a child experiencing a night terror can be futile. Waking a child is also not advised because if you are successful, your child is likely to be disoriented or confused. It can also take your child longer to return to sleep. Night terrors can be a normal part of development for some children. Assistance from a psychologist or family doctor should be sought if night terrors occur repeatedly, become more frequent, routinely disrupt sleep, cause fear of going to sleep, lead to dangerous behaviours or injury, or persist beyond teen years. A psychologist can help establish good sleep hygiene and address underlying issues such as stress and anxiety. Your family doctor can help determine if a referral to a sleep specialist is recommended.